Nothing says drama like setting something on fire. 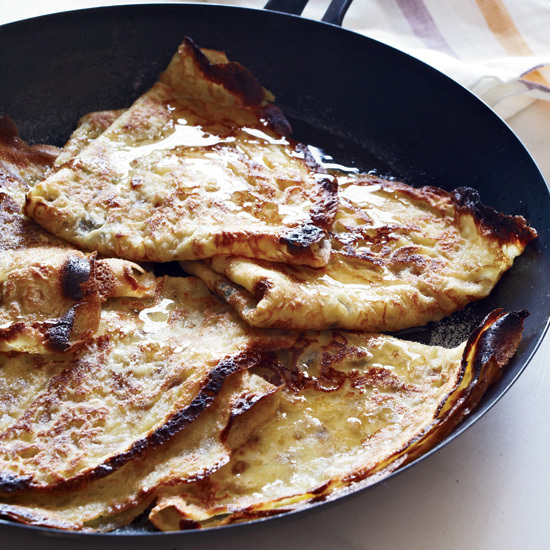 Here, seven show-stopping flambéed recipes perfect for your next dinner party. While restaurants traditionally make the buttery, orange-flavored sauce for this famous dessert tableside from start to finish, Jacques Pépin finds it easier to prepare largely in advance when entertaining. He flambés the liquor in front of his dinner guests and pours it over the platter of crêpes while still flaming. In this tropical dessert, pineapple spears are drizzled with rum then lit on fire for a deliciously caramelized flavor. It’s great on ice cream. "I created this dish late one night when I was hungry and tired of my menu," Sue Torres says. "The tequila adds a little smokiness to the shrimp, and I liked the great textural difference between the creamy avocado and the crispy tostada." When Queen Victoria celebrated the 50th year of her reign, the eminent chef Auguste Escoffier created a dish in her honor called Cerises Jubilee: cherries poached in sugar syrup and kirsch, then flambéed. This updated version calls for prunes, Asian spices and brandy. This unorthodox take on cannelloni pairs a chive-flecked ricotta filling with an intensely flavored topping of leeks and shrimp that are sautéed in olive oil, then flambéed with Armagnac. This is an excellent grown-up version of an ice cream sundae, made with lush nectarines flambéed in bourbon. For a dramatic ending, the roasted fish is flambéed with anise-y Pernod.